Many people don’t think much about insurance until they recognize they need to buy it and buying insurance doesn’t really sound like fun. Nearly everyone at some point finds they are very glad they have that insurance policy when bad things happen; hard to describe filing an insurance claim as a reason to celebrate. So, people buy insurance every day because they know they need it and file claims everyday on insurance they bought to protect them from the unfortunate turns in life, but they’re not feeling the love. Well, who is having fun? The good Insurance Representative who helped those people recognize the inevitable risks and properly protect themselves for the unfortunate turn. Like a Firefighter, you hope you don’t need one, but you absolutely want them to do their job well. Our business at Henry Insurance Services is Commercial and Personal Line Insurance and we have a great team of Sales Representatives who we call “Producers.” Henry Insurance Producers are the “firefighters of risk management” and here, we want to celebrate them by sharing a little of their perspective. Most of our Producers will say they didn’t really plan for a career in a sales role! 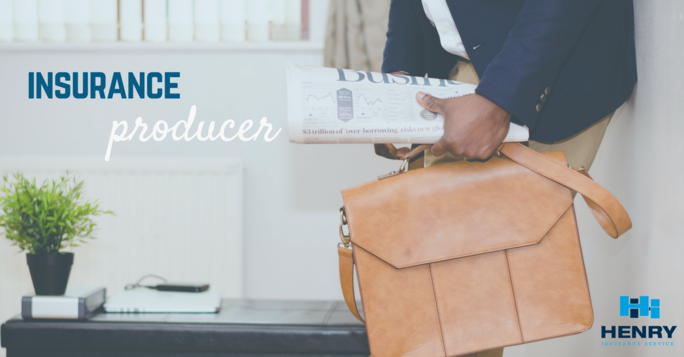 The backgrounds and paths Producers take to arrive here are quite diverse but there are common attributes the successful Producers share. The most valuable quality of good Insurance Producers is a sincere desire to get to know and understand the needs of their clients. Henry Insurance Producers must get to know the client and work to protect them over time through a changing world. We’re always looking for people who possess the key qualities and who are interested in pursuing a career as an Insurance Producer. Personal testimony is a great way to understand what a person does and how they feel so we interviewed one of our own Henry Insurance Producers as a way of celebrating and promoting the role by the following Q&A. What is unique about your job and what are some benefits of working for Henry Insurance? As a Henry Insurance Producer, I get to establish relationships with clients that span decades. I feel fortunate to be able to grow ongoing partnerships that benefit us both personally as well professionally. My daily schedule is very flexible. I’m in and out of the office as client needs dictate. I block out office hours to assure appropriate time is spent on things like meeting preparation, training and client research, but most of my work hours are spent out with clients. What are common challenges that Insurance Producers face? You really need an eye for detail in matching insurance protection to the client needs without getting lost in the weeds. I want to be really thorough in selecting the right coverage for my clients. Staying organized takes effort with things like reviewing detailed coverage needs, managing a flexible office schedule, and being prepared for client meetings. What are some of the benefits of your job at Henry Insurance? Being a self-directed person, I like setting my own pace and my own agenda. By that I mean I have the flexibility to target industries or markets that I’m interested in! For example, with an interest in real estate and construction, I can put my efforts toward protecting contractors, real estate brokers, owners, and rental companies. I work the schedule and choose activities I determine most effective to serve my clients. Another benefit is the Henry Insurance team has been more than willing to help me grow and learn. What types of skills do you find necessary to do your job well? I think I can summarize the necessary skills as Discipline, Communication, Desire to Learn and Patience. With the luxury of working independently comes the need for discipline to do what you know you need to do. You need to have the confidence to communicate clearly and openly with clients, support staff and providers. The market is always changing as are the needs of clients so you must keep up by always working to learn new products and market requirements. And lastly is you need to have patience in developing your business over time. It’s also important to have personal characteristics such as being trustworthy, attentive, and having a likable personality. What education is helpful for this role? There is really no one tract of education for an Insurance Producer. I think many college degrees can apply well such as business, marketing or finance for technical skills. Other skills are important as well when you consider the importance of communication for example. It’s a diverse group. We love our Henry Insurance Producers as much as they love their jobs. We’re also proud of the valuable service they deliver for our clients day in and day out. If you or someone you know seems like a good fit and is interested in a solid career with Henry Insurance, reach out to us here.